Cruz and his friends are searching for clues left behind by Cruz’s mother, on a quest that will take them to Norway and Iceland. The team stops along the way to do some underwater diving, help some whales in trouble, and tour the beauties of Norway in between their Academy classes and explorer training. 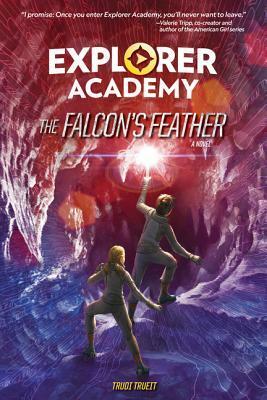 Cruz and Emmett soon discover that there are spies on board the Academy’s flagship, Orion, and they don’t know who to trust. When Cruz’s diving equipment fails and puts his life in danger, it only makes him more determined than ever to find some answers. I didn’t think it was possible for this book to be even BETTER than the first one, but WOW! I am so crazy impressed with this series. The plot is non-stop action with tons of wonderful adventure, mystery, puzzles, spies, betrayal, high-tech gadgets, and of course, the fascinating characters. I loved reading so many true facts about exploring, conservation, wildlife, history, and Nordic culture, all perfectly interwoven with the story. I loved the dynamics between characters, both Cruz’s friends and classmates, and the teachers and scientists that interact with them. Every character is memorable and interesting. Cruz especially is very relatable and charismatic, and I was cheering for him in every chapter. I connected with many of the characters on an emotional level, and so many of the new characters have a question mark hanging over their head- “Can we trust them? Are they a spy for the enemy?” It raised so much suspense, and lent significance to every little thing. The beautiful Nordic landscapes, both in Iceland and Norway, were truly incredible to read about, and sent me searching for photos on the internet, curious to learn even more about these rich cultures. The writing is excellent, and really draws you into the story. I could barely put this book down and read it in two days! Can’t wait to read more from this series. Disclaimer: I receive a copy of this book from the publisher in exchange for a free and honest review. All the opinions stated here are my own true thoughts, and are not influenced by anyone.